Why should I hire a pet sitter and not use my friends, family, or neighbors? Although friends, family, and neighbors have great intensions, very often their personal schedules cannot really take on another responsibility. The end result is that your pet(s) do not get let out or fed at the same time(s) everyday or at all. In addition, you are opening your house to unlicensed and uninsured caregivers. Experience does matter when hiring a pet sitter as many things can arise when you are out of town. Why do you request 2 keys? There are several reasons why we request 2 house keys. Why do you keep my keys on file? Keeping your keys on file saves you money and gives you the convenience of last minute bookings. Very often, our clients will have emergencies or plan last minute trips. Having your keys on file allows us to fulfill your requests without arranging a time to pick up your keys again. Note: All keys are kept in a locked and secure safe for your protection. The reason we dont allow job sharing, is simply, it is an insurance liability. We can only be responsible for your pets and property at the time we are there. Having others come and go creates an uncontrolled environment. In a situation, where job sharing is unavoidable, we must waive the companies insurance liability. Can I leave doors/windows open while I am gone? wide open, we cannot be responsible for any theft, pet loss, or damage that may incur and again we must waive the liability. Will you let my dog run off lead? Or, my cat outside? Unfortunately, we cannot let your dog off lead as there is a leash law in the Las Vegas Valley. 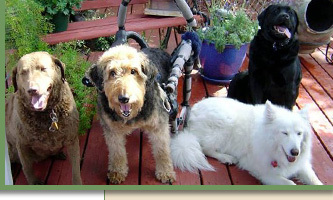 In addition, our insurance company will not pay out a claim if the accident occurs while a dog is off lead. Cats, we won't let out with out proper cat fencing or leashes. If your cat should leap over a wall while outside, we may not be able to get your pet back into the safety of his/her home, which means, your cat would be left outside until our next visit. Bonds usually require that the person be convicted of the crime before the bonding company would make a payment. The bond further requires that the individual make full restitution to the bond company for the payment. Our insurance carries a special personal property endorsement providing a broader coverage and includes losses such as breakage, destruction, mysterious disappearance and loss caused by an employee's theft from your premises. Side note: In 5 years of business, we have a sparkling record and have never needed to make an insurance claim. Every minute, dogs take 10 to 30 breaths compared to humans who take 12 to 20 breaths. Whippets can reach a maximum speed of 35 miles per hour. Most people think that dogs sweat by salivating, but they actually sweat through the pads of their feet. Cats with white coats and blue eyes are commonly born deaf, though they make up for it with their other senses. The type of name that cats respond most readily to are those that end in an "ee" sound.